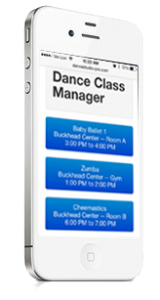 Take the pain out of dance studio class management. It’s time to get organized and take control of your classroom. Use the iPad or iPhone Class manager to rule the class room. – Make critical notes about a class progression. – Play Music directly from your mobile device. Everything is backed by the Dance Studio Pro software so that you have all of your information right at your hands.